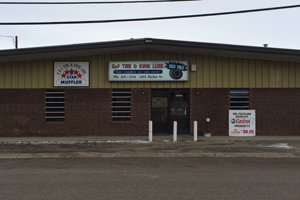 G & F Tire & Kwik Lube has been Regina’s provider of quick lube service, tires, and auto repairs since the mid 1980’s. We have 30 years of experience in all the service areas we offer, from oil changes to tune-ups and tire rotation. Our technicians are fast, efficient, and friendly in every service interaction. We take pride in being your complete car care centre. We maintain a clean, organized garage, with several bays available to work on many cars at once, resulting in faster turnaround times. In addition to services, we also have new and used tires and will help you find what meets your needs and budget. We are conveniently located on McAra Street, a local sign shop and across the street from A-Line Mechanical Heating Ltd. We’re also open Saturdays for your convenience. Call us to schedule your service or stop in today.